Resolutions are a bit rubbish aren't they? For a month, you're on this, that and every diet, vowing to lay off every fatty food known to man and go to the gym 8 times a week. Give it a few weeks, maybe even make it to the end of January if you have a strong resolve, but the fact is that very few of you will last into February. I just find it not to bother at all these days. However, one thing I wanted to do more of last year was to eat more outside of London, and to be fair, I was pretty rubbish at that too. I did manage trips to LA, San Francisco and a holiday to Italy (they don't count), as well as a rather incongruous visit to a Beefeater in Telford. A few days in Cambridge and Birmingham saw me visit Alimentum and Purnells, as well as managing another trip to the Sportsman, so not a total loss. As a final throw of the dice in order to bring this resolution to some sort of respectability, I headed out to Surbiton (not strictly out of town, but on the edge of zone 6, so might as well be) and sat down with my family at the French Table for one big blow out before the New Year. 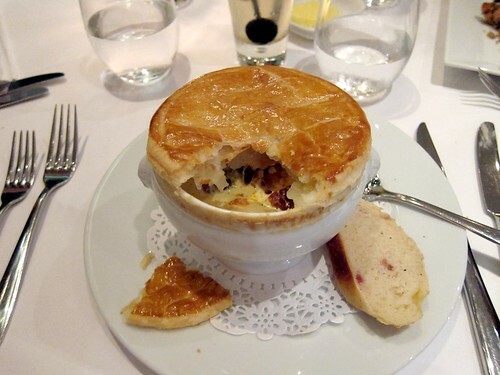 I've always found French cuisine a little on the predictable side, and in doing so, rather dull, but was quite surprised with what was served. The gruyere and bacon bread we were given as we were perusing the menu was amongst the best bread I had ever eaten. Delicate slices packed with nuggets of bacon and packed with subtle cheesy flavour. It had my taste buds fizzing and had to resist myself from asking for more. 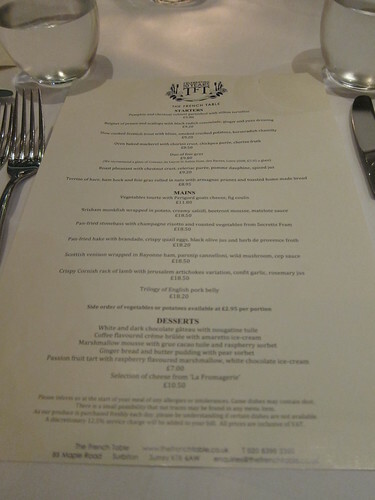 The menu itself was undoubtedly packed with French influences and techniques, although there were typical external European influences included too, all the hallmarks of a modern "French" English restaurant. The menu itself covered all the main food groups, ranging from scallops and trout to venison and pork. Between my family and I, we managed to consume most of these. My starter consisted of a pastry topping over a broth of smoked fish, seafood and a creamy white wine reduction, absolute bliss. Other starters of scallops and pheasant were perfectly cooked and paired with foreign influences. The scallops came packed with Japanese influences of black radish, ginger and yuzu whilst the pheasant was more "Franglais", being served with flavours of chestnut and celeriac. I opted for the special of the day for my main, beef with chanterelles served with a deeply flavoured red wine jus and mash, comfort food to the max. I mopped up every dreg of sauce. 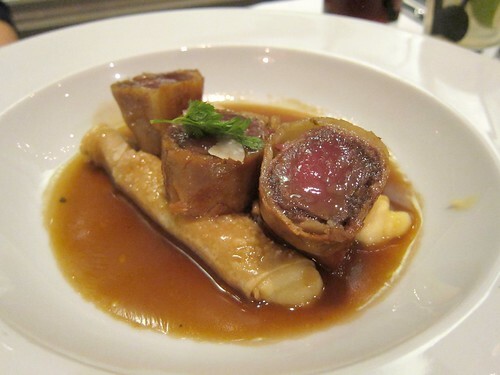 Mains of rack of lamb and hake were more classic, although the venison was probably the most adventurous, paired with a parsnip canneloni and wrapped in bayonne ham. As always, once you've made your way through so much rich food, desserts are often an afterthought, but in my family, never forgotten. Much of the menu circles around tarts and gateaus, all far too rich for me, so I went for the rather more interesting option of a marshwallow mousse, cacao tuile and raspberry sorbet. What is marshmallow mousse you say? Good question, I am still not too sure, but what I got was sticky and sweet. 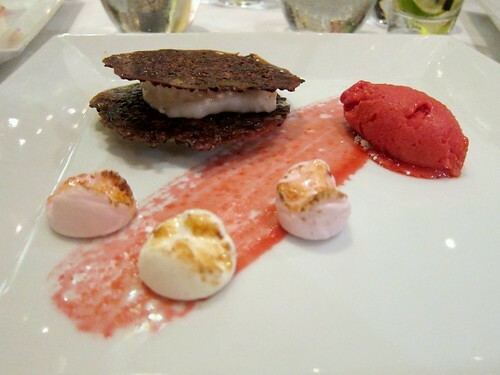 Although the tuile was slightly over done, it added a nice nutty contrast in texture and the raspberry sorbet was sweet yet tart, clearing the palate ready for the next bite. Spending time with my family can be taxing at the best of times, but one thing we all appreciate is good food. I can thankfully report that there were no disagreements and we even managed to distribute bites of each others dishes to each other without so much as a hiss or a look of disdain. The French Table does an excellent job uniting the flavours of Europe on the edge of London using French techniques, and although seemingly confused, they somehow pull it off. It's definitely not cheap, but affordable enough and based in the heart of the commuter belt, I guess that's no surprise. Surbiton is a mere 20 minutes by train from Waterloo and comes highly recommended.